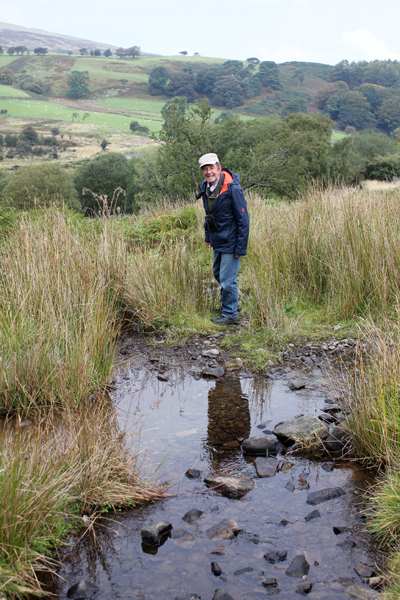 Richard Surman, Ron Crossley, DaveB and I headed over to Cilcain near Loggerheads in Wales for an Autumnal walk around our usual circuit. Walking up the lane there were a few plants still in flower – Nipplewort Lapsana communis and Herb-Robert Geranium robertianum with others gone to seed – Enchanter’s-nightshade Circaea lutetiana, Common Figwort Scrophularia nodosa, Foxglove Digitalis purpurea and Cleavers Galium aparine. We noted some Cola-nut Galls on Pedunculate Oak Quercus robur caused by the Gall Wasp Andricus lignicola, Hazel Leaf Miner Phyllonorycter coryli and the first Fungi of the day with Oak Barkspot Diatrypella quercina and Common Tarcrust Diatrype stigma. Quite a number of Robins in song, Pheasants creeping amongst the undergrowth at the side of the path being flushed as we walked by, the first of many Ravens croaking overhead, a soft ‘pheuuing’ Bullfinch, Chaffinch, Nuthatch and Great Spotted Woodpecker. The higher of the fishing ponds held a Mallard and Moorhen. More Fungi with Sulphur Tuft Hypholoma fasciculare, some rather sizeable but slug eaten Fly Agaric Amanita muscaria, a couple of Boletus sp. and on a tree stump a clump of Flaming Scalycap Pholiota flammans and a lone Common Inkcap Coprinus atramentarius. 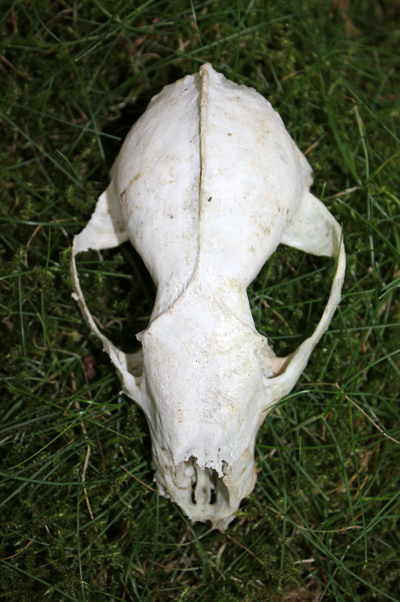 By the edge of the track where we turn left onto the moor I spotted a Badger Meles meles skull. The Heather Calluna vulgaris had mostly died off but patches of Bell Heather Erica cinerea were still flowering along with European Gorse Ulex europaeus, Tormentil Potentilla erecta and delicate flowers of Harebell Campanula rotundifolia. The Bilberry Vaccinium myrtillus had a few berries and the occasional Rowan Sorbus aucuparia was laden with fruit. 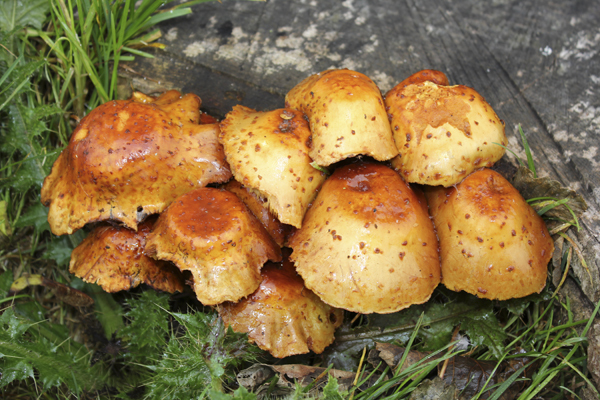 Yet more Fungi with Brown (Dusky) Puffball Bovista nigrescens, Golden Spindles Clavulinopsis fusiformis, Blackening Waxcap Hygrocybe conica, Meadow Waxcap Hygrocybe pratensis, Brittlegill Russula sp. 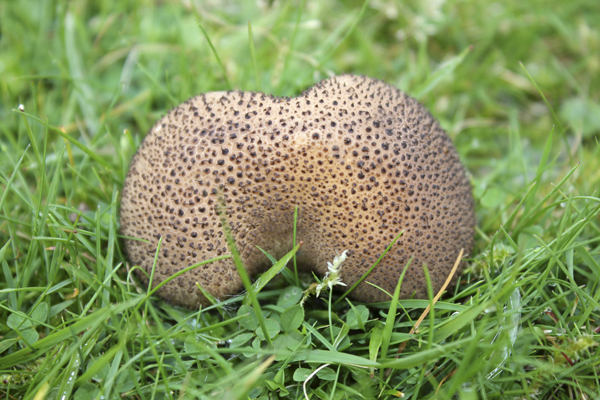 and Plums and Custard Tricholomopsis rutilans. I spotted a caterpillar that I later identified as the brown form of the Broom Moth Ceramica pisi. 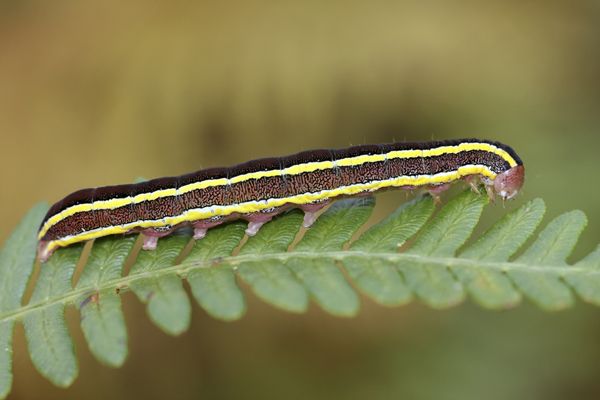 The distinctive brown and yellow striped caterpillar with groovy pink feet feeds not only on Broom Cytisus scoparius, but also on Bracken Pteridium aquilinum on which we found it. 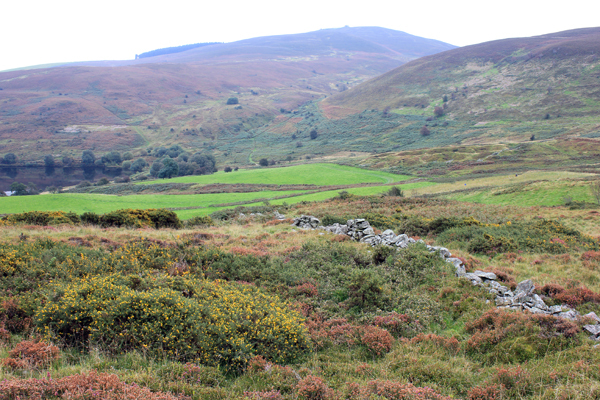 A few Mepits were flitting around the moor and a Tawny Owl hooting from the copse across the valley. More vocal Ravens and due to the still windless conditions we could even hear the beat of their wings as they flew overhead. One posed majestically on top of a rock that broke the skyline allowing a good silhouette view of its shaggy throat feathers as it croaked. It took off and a few minutes later along with its partner were harassing a Buzzard. We found the remains of a Carrion Crow – only the wings and rib cage – again probably the victim of the Ravens.